Ministers in the UK have been ridiculed for trying to ban the term “pregnant women” — as it could offend transgender parents. Instead, they’d like the term changed to “pregnant people”, so as to not “exclude transgender people who have given birth”. Fellow MPs and feminists both in the UK and around the world have slammed the move, calling it an “absolutely idiotic” proposal, according to The Sun. According to The Sunday Times, in the statement from the Foreign and Commonwealth Office (FCO) they pointed out that Britain opposes the use of the term “pregnant woman” in the part of the UN treaty which says they must be protected and not subject to the death penalty. The civil servants’ intervention has infuriated feminists, who branded it the latest example of “making women unmentionable”. In Australia the Nursing and Midwifery Board has been slammed for trying to remove the word ‘woman’ from their code of conduct. The board had proposed replacing the word ‘woman’ with ‘person’ so as not to offend females who identify as men, but that idea was shot down when complaints flowed in from around Australia. The new Code of Conduct for Midwives, which was due to come into effect from March 1, 2018 will retain the phrase ‘woman-centred’. Australian College of Midwives spokeswoman Sarah Stewart said it was important to protect women’s identity. ‘Once we start moving down the road of talking about women as persons, we lose women’s identity – fundamental essence,’ she told The Advertiser. Ms Stewart said although there were ‘individual instances’ of females who identify as men, the vast majority of people cared for by midwives are women. ‘There was support for the use of both ‘woman-centered’ and ‘person-centered’ in the feedback on the Code of conduct for midwives. Overall the feedback from the midwifery profession and key midwifery stakeholders, including the College of Midwives, strongly supported the use of the term ‘woman’ to describe the interaction between a midwife and the person receiving care. ‘The feedback covered that “woman-centred” is a term well understood by midwives and women are at the centre of midwifery care. ‘The definition of the term “woman” is very broad and refers to all individuals who have entered into a professional relationship with a midwife. ‘”Woman” is inclusive of the woman’s baby, partner and family. A group calling for Australians to be more inclusive by adopting non-gender specific terms has been slammed on social media. The Equality Institute, a Melbourne-based ‘feminist’ organisation, is renowned for improving gender equality but their tweet about pregnancy on Tuesday caused a huge backlash. 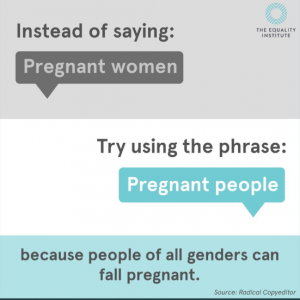 In the tweet, the global research and creative agency suggested people should use the term pregnant ‘pregnant people’ instead of ‘pregnant women’. ‘People of all genders can fall pregnant, because people of all genders can have the reproductive organs to do so,’ the tweet stated. The Tweet gained lots of negative response with many people disagreeing with their message. Women have babies, the term is pregnant women. Do you think this is going too far? If transgender people didn’t realise that the one thing they couldn’t do was to engineer their bodies to be able to have children, they are even nuttier than I first thought. About time the PC stopped being so precious. I am confident that this transgender stuff is all one big social experiment. We need to stop changing everything to fit the minority. If you are using your female reproductive organs to birth a baby then just deal with it. Somebody told me you can’t say breastfeeding, you need to use the term “chestfeeding” To that I say, stop the world, I’m getting off. This is just ridiculous. Only someone with female body parts can have a baby. I suppose they are then going to change the name of the midwife to what, a midperson? The world has gone bonkers. I LOVE your comment. Let me off too! This is so ridiculous! Last time I checked only a woman can get pregnant. If someone is transgender it should not offend them if they were pregnant when they were a woman, and if they have not fully undergone the transition and can fall pregnant, then they are ultimately still a woman biologically. This is just going too far! I am so sick of the PC brigade and I think this is an absolutely ridiculous suggestion. Funny, women are trying to claim certain things, but being stripped of others. I totally agree this just shows that government are trying to go too far with gender equality. Biologically only women (or females) can be pregnant. Next we won’t be able to say anything at all. This is getting so ridiculous. Political correctness gone mad yet again. It refers to woman which is pregnant. Surely we aren’t supposed to call one a pregnant person. I think a transgender person who is becoming a man by taking medication is likely to cause deformities to the unborn baby. How could a man who is taking medication to become a woman “carry” a baby? ?